Every one is welcome at The Marlipins. We offer great service in a traditonal olde world pub with low beams. We serve fine real ales, chilled lagers and superb wines . Our food is home made and very, very tasty and incredibly good value. You can eat in the bar or the conservatory restaurant and even in the courtyard garden , the choice is yours to make. We open for food at 10 am Monday - Saturday and serve until 2pm. offering an extensive menu featuring steaks, jacket potatoes, salads, sandwiches, our homemade steak and guinness pie, corned beef hash, curry and chilli con carne plus our daily specials, we even serve our Marli Mega breakfast only £5.95, all the food is freshly cooked to order especially for you. On Sunday we serve food from Noon until 4pm. - the full menu plus a choice of Roasts & vegetarian options. We serve real Italian pizzas every night from 6am 'til 10pm , only £5 each. Join our coffee club, collect 5 stamps & get the 6th. cup free. & don't forget to get your free home baked scone when you purchase a hot beverage, only available Monday to Saturday between 10am and noon. On weekdays we offer our Credit Crunch lunches, £4.99 each, you can choose from Battered haddock & fries, Herby chicken breast with salad and new potatoes,Spaghetti Bolognese, a Marli burger & fries, vegetable curry & rice or even braised sausage in red wine with real mash. The choice is yours. Come and meet the team and experience a real pub, with real beer and real cheer ! Why not join us on Monday at 8.30pm for our Quiz night, or Tuesday for our Darts night which starts at 8pm, a free hot dog for all participants, both are only a £1 to enter. Hope to see you soon. 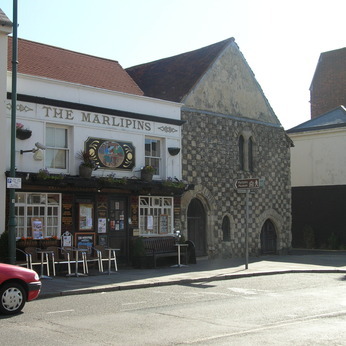 Marlipins and local charity Food & Friendship, are teaming up to put on a festive lunch for people living locally who could do with some companionship this Christmas.